Stanley House is a special place for Aimee Hosker and Craig Harrison as in February 2017, Craig proposed at the country house, which was a completely surprise for primary school teacher Aimee. Fast forward 12 months and they tied the knot there, almost to the day, surrounded by their friends and family. They met in Leeds in 2011 on a night out for a joint friend’s 21st birthday and moved to St Annes together a few years later to be closer to Craig’s job as first assistant green keeper at Royal Lytham and St Annes Golf Club. The whole wedding day was spent at Stanley House – beginning with the ceremony at 1pm. 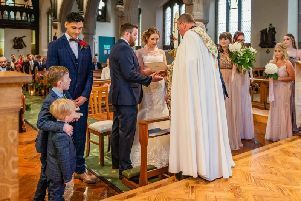 Aimee said: “The ceremony was the bit that we were both most nervous about, however this turned out to be one of our most favourite parts of the day. The readings were performed by my Aimee’s mum Christine, her sister Emily and friend Chelsea Bruce-Smith. Family friend Samantha Harper sang during the signing of the register. The afternoon began with the speeches which were very special for the couple, funny and emotional, before everyone tucked in to a scrumptious meal. The couple cut their wedding cake at the start of the evening reception before their first dance to Ed Sheeran’s How Would You Feel? “Megan Williams was our Stanley House host and she was fabulous from start to finish,” said Aimee. “The day was honestly the best day of my life.